If you are active on social media or have a group that you believe would be interested in finding out more about Wishbone, we’ve created some sample text you can copy and use on your site, in your groups or on your social media accounts. Join our email list for periodic updates. 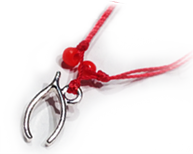 The wishbone charm signifies the wish for a healthy, beautiful baby. It had a significant meaning to Brad and Jianna during their pregnancy and has become the symbol of our mission here at Wishbone Foundation. It costs approximately $300 to send a nurse or social worker through Wishbone Bereavement Training. Donate now to provide them this opportunity.